Dr. Isaac Lindsey Isaac Tyrone Sly Lindsey, Sr., Ph.d is a blessed Christian man who wears many hats. He says that his Grandparents who raised him and his parents always taught him..."to whom much is given, much is required". Tyrone as he is affectionately called by family and friends is a high honors graduate of the Durant Public School and the Jacob J. McClain High School. He attended the prestigious Tougaloo College in Tougaloo, Mississippi which is near Jackson where he toured and performed with the world famous Tougaloo College Concert Choir. He later received a Bachelor of Science in Business Administration Degree from Global Evangelical Christian College and Seminary in Montgomery, Alabama. He also holds several Honorary Doctorate degrees from some of the World’s most highly respected and accredited Universities including his Alma Mater. 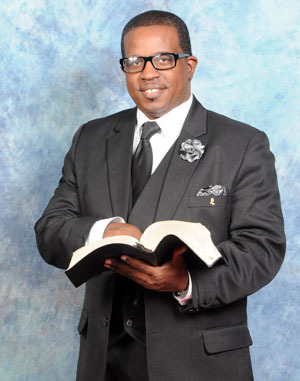 He presently serves as Senior Pastor of the New Zion Missionary Baptist Church in Vaughan, Mississippi and Youth Pastor of the New Canaan Missionary Baptist Church in Pickens, Mississippi. He not only ministers at the Churches he serves weekly, but he is also one of the most in demand preachers in the country who accepts at least 150 other engagements annually. Dr. Lindsey is an Award Winning Multi-Media Enthusiast who is currently employed as the Weekday Early Morning Radio Host for WMPR 90.1 FM in Jackson, Mississippi which boasts 100,000 watts of power and covers nearly a 100 mile radius in each direction and portions of Alabama, Arkansas, & Louisiana. He’s the Executive Producer and Host of Praise In The House – The Isaac Lindsey TV Show which airs on Comcast Cable in Jackson, Columbus, Starkville, and Tupelo, Mississippi and in Memphis, Tennessee. He’s also the Co-Founder of Gospel Quartets of America, a Founding Board Member of the Arenia C. Mallory Community Health Centers, a Founding Board Member and Treasurer of the Christian Ministers Coalition, Board Member of the Boy and Girls Club, a Board Member for the Humanitarian Organization for Moral Empowerment, a Member of the NAACP, Operation PUSH, National Action Network, and Executive Producer, Host, and Web Developer and Designer of PraiseInTheHouseRadio.com. Because of his commitment to excellence and hard work, he has become one of the most sought after hosts and emcees of most major events in Mississippi, Illinois, Alabama, Tennessee, Georgia, Arkansas, Louisiana, Texas, Florida, New York, and even recently in California. God has also for entrusted Dr. Lindsey with the gift of music as a Gospel Singer, Musician, Composer, Arranger, Recording Artist and Producer with The Windy City SpiritualaireS, The Golden Bells, The True Believers, and he began his recording career with the late Walter Bruce & The Mighty Soul Travelers. Dr. Lindsey also currently serves as the Manager for the three-time Grammy Award winning – Joe Ligon & The Mighty Clouds of Joy. He’s also a National Gospel Events Promoter with Praise In The House Productions and IT’S Lindsey Promotions which produces and markets some of the largest events in the World. Out of all of the many things that Dr. Lindsey is involved in, he says that his greatest joy is spending time with his family. He's a proud father of five handsome sons and three beautiful daughters ranging in age from 24 to 14 and more recently he became a Grandfather of one Grandson. He will testify to anybody that will listen that all of his Children are exceptionally smart and gifted students and workers for Christ. He knows that he is better than blessed to still have a living Mother, Father, Grandmother, two younger Brothers, one younger Sister, one Niece, one Nephew, and a host of Aunts, Uncles, and Cousins. This year marks Dr. Lindsey’s 29th Year as a Gospel Radio Announcer, and an Events Promoter, his 19th Year as a Television Show Producer and Host, and his 19th Year as a Preacher and Teacher of God’s Word. His work in Gospel Music has not gone unnoticed. He has won the coveted Announcer and Promoter of the Year Awards from the American Gospel Quartet Convention on multiple occasions and he has been inducted into the AGQC Gospel Music Promoters Hall of Fame. He was the winner of the 2015 Statewide Gospel Announcer of the Year, the 2016 Don “Linzy” Dixon Memorial Lifetime Achievement Awards, and a Special Recognition Plaque from the Farish Street Festival. Dr. Lindsey has also been the only Gospel Radio Announcer from Mississippi whose name has appeared on the prestigious Stellar Awards ballot for the past three years in a row. He is currently in the process of writing his first book, recording his first solo project, and rumor has it that he is considering entering the political ranks. He says that there is a lot more that God has in store for him to be a blessing to the Body of Christ and the people of God. The best is yet to come. So, hold on, your blessing is coming! To God Be The Glory!! !